Martina McBride (born Martina Mariea Schiff on 29 June 1966 in Sharon, Kansas), is an American country music singer-songwriter. Martina McBride's music singles include, Wrong Again, I Love You, Blessed, and This One's for the Girls. 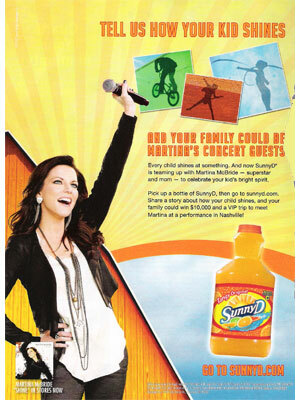 Martina is the face of the 2010 Sunny Delight ad campaign.